Dust off your running shoes and whip out your dogs (not that one, sir) and glitter! The months of August and October are being graced by two races that aren’t your average, run-of-the-mill races: The Color Run (August) and the Light Up Your Life Run (October). The Color Run is back again for the third consecutive year with sponsor CIMB Bank Singapore to colour the nation with runners as we celebrate Singapore’s 50 years of independence. Held over the weekend of 22 and 23 August 2015 on Sentosa, the run will see its participants being the first in the region this year to experience a dash of sparkle and razzle-dazzle. 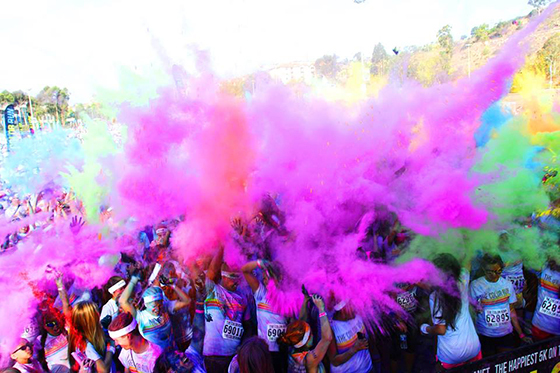 Upping the ante on the fun factor, the colourful race will see participants being completely doused in colored glitter powder as they pass through “Shine” color zones and the Finish Festival where they can party on into the night! Styled as the “Happiest 5K on the Planet”, the vibrant event not only celebrates health, happiness, and individuality – the Color Run continues to be dedicated towards the Coalition Against Bullying for Children and Youth (CABCY), donating $1 from every registration to spread awareness and combat bullying. And for all those of you who have always lamented about not being able to bring your dog for marathons and races, get yo leash ready! The Light Up Your Life Run is a unique charity run organized by animal welfare organization, Save Our Street Dogs (SOSD), and charity organization, Assisi Hospice to raise funds. Held amongst the tranquil ambiences of East Coast Park on 3 October 2015, the evening race offers non-competitive events of an individual 5km and 10km run, as well as a 2km dog walk (dog accompanied by owner). Every participant receives a goodie bag worth $250, chock full of cool stuff like vitamins, pet food and vouchers! Participants and members will also have the delight of enjoying the charity run’s fringe activities of mini-carnivals and family activities at the event site. All funds raised during the event will go towards the operating expenses for both charities and supporting SOSD in implementing more community-focused initiatives such as the Animal Assisted Activities (AAA) programme that will benefit both people and animals and increase social awareness.